An Italy yacht charter in the Tuscan archipelago, consisting of seven idyllic islands will reveal magnificent unspoiled scenery, romantic coastlines and numerous ancient ports. 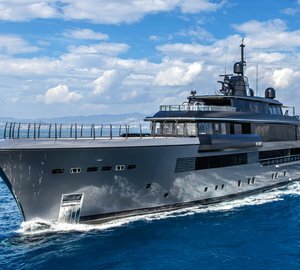 The spectacular Tuscan archipelago is ideal for sailing yachts and luxury motor yachts alike with its outstanding flora and fauna and crystalline multi-hued glimmering Mediterranean waters that comprise this extraordinary marine park, the largest one found in Europe. On your Tuscany luxury yacht charter you can visit the largest island in the spectacular Tuscan archipelago, Elba, which is followed closely by Gilio. Elba is a superb destination to stop on your charter holiday with both fine sand and pebbled beaches. Gilio is wild and untamed and a hot tourist Mecca at once. Your Italy yacht charter vacation will progress onto Portoazzuro on Elba Island with beautiful crystalline waters matched with picturesque bays, islets and coves. Next, you will cruise onto the magnificent sandy beaches of Portoferrio and Fetovaia, Calanova, Biodola and Costa del Sole. You will enjoy a day excursion to Marciana Marina, an old colorful village with a vibrant nightlife. 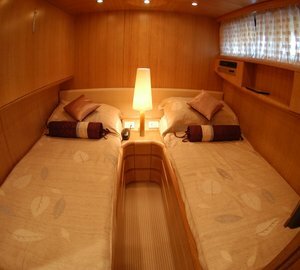 You will have the opportunity to spend the night moored in the beautiful port if the winds are not too strong if you so desire. From Elba Island you can sail to Capraia Island, near Portoferrio, with its small yet beautiful harbour. For diving and snorkeling enthusiasts Carla Mortola and Cala Rossa are easily accessible by yachts. Your sailing holiday will continue north onto Corsica Island and further onto spectacular Saint Florent, an extremely attractive small town with its beautiful ancient citadel. You will undoubtedly be very impressed as you sail along the magnificent coastline of Tuscany on your yacht charter sailing vacation while you discover the well-renowned cliff-side townships of the spectacular Cinque Terre. 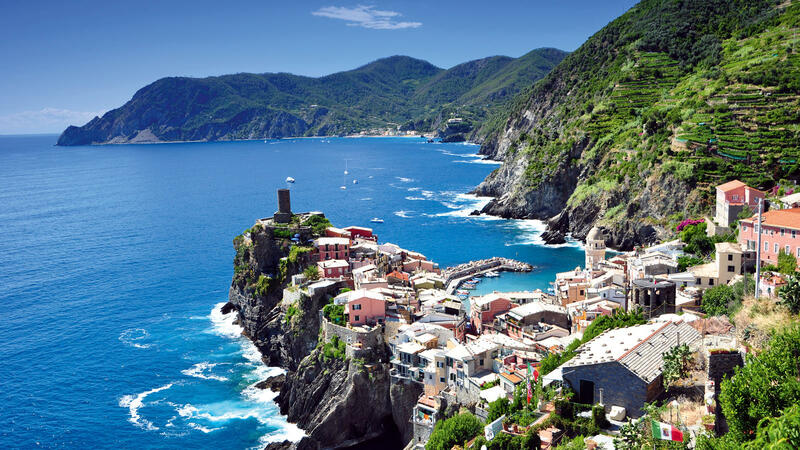 Your motor yacht charter vacation will moor in the idyllic port of Marina di Carrara where visitors will enjoy the magnificent views of Corniglia, Manarolia and picturesque Riomaggiore before heading further up the idyllic coast to Vernazza. You will enjoy placing your feet firmly on dry ground and exploring the historic township and local traditions and culture of Portovenere. Your motor yacht charter can sail to the southern end of beautiful Tuscany in Etrusca Marina, Folloncia, Cala Galera, Piombino, Salivoli, Elba, Capraia, Punta Ala, Giannutri and Giglio. Each of these charter destinations in Tuscany are regarded as superb locations for an excellent crewed yacht chartering around the picturesque Tuscan archipelago. On your Tuscany sailing yacht charter vacation for more experienced more sailors can enjoy a yacht charter with unparalleled high levels of freedom and privacy. On your sail boat charter vacation you will sail past picturesque old towns, uncrowded pristine sandy beaches through bright-blue crystalline waters to beautiful secluded anchorages and relatively unknown bays, coves and islets. Tuscany boasts extraordinary destinations such as Lucca and the spectacular coast, Florence, Pisa, Pistoia, Siena, Arezzo and Cortona, where you will encounter many customs and ancient traditions. You are sure to enjoy the sumptuous cuisine served Sciacchetra - a lovely dessert wine. During your Tuscany yacht charter holiday, enjoy the wild havens and hidden gems of the Tuscan Archipelago. Here are 6 essential 'must see' attractions ot consider on your Italian private yacht charter holiday. 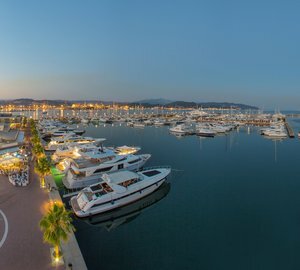 Spend the night on your luxury yacht at anchor close to the beautiful Porto Azzurro. Get up bright and early so you can head over to Capoliveri for some retail therapy. Capoliveri has a good number of charming shops specialising in quality goods for acquired tastes. After a little shopping, dine at La Taverna dei Poeti, a quaint local restaurant. Try the tuna burger starter and the Gragnano paccheri pasta with grouper, it’s delicious. This tiny island, located southwest of Elba, was once a penal colony. It was also the place of Napoleon’s exile in 1814-1815. Elba’s inaccessibility has saved it from mass tourism. The diving here, with authorised guides, is quite unique. You’ll be able to see things like redfish, grouper and molluscs that you won’t find in other places. What’s more the water is absolutely sensational. If you want to spend a fantastic night at anchor on your charter boat then take a refreshing dip at sunrise, the beautiful cove at Fetovaia, Elba, is the place to be. For a much more secretive and secluded, yet equally spectacular spot on Elba, you can’t beat Sansone Beach. It’s an inviting, enchanting white pebble cove with steep white cliffs. Sansone Beach is simply one of the best beaches in the Mediterranean. No yacht charter vacation to the Tuscan Archipelago would be complete without visiting Giglio Island. Here you can enjoy drinking the best cocktails in Il Demino at Demo’s Hotel on the beach right next to Giglio Port. Being right on the water’s edge, why not pass a night on the terrace waiting for sunrise drinking a margarita or two? Caldane Beach is one of the most stunning and private beaches on Giglio. You can only arrive onto the beach by boat or on foot. It can also be quite a wild beach so a little choppy from time to time. Take a swim in the blue crystal-clear waters before relaxing on the beach and topping up your tan. For something a little different on your yacht charter holiday, how about a trekking or bike tour on Capraia Island? Have you got what it takes to complete the Percorso dello Stagnone, The Stagnone Path? The trail begins by the church in the village of Capraia, climbing up the mountain before descending towards the harbour. In the spring time, you can see rare orchids, wild flowers and herbs. After completing the Percorso dello Stagnone, it’s reassuring to know that you can then return to your superyacht charter vessel for a relaxing, soothing massage. 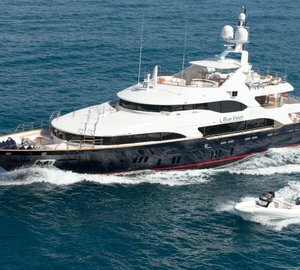 Below is a list of outstanding Tuscany charter yachts, you can view additional Tuscany yachts here or contact us for more information. Tuscany Yacht Charter A yacht charter in the Italian Tuscan archipelago, consisting of seven idyllic islands will reveal magnificent unspoiled scenery, romantic coastlines and numerous ancient ports. Explore Location Guides for great destinations near Tuscany .